Alice A. Puhr, 99, Enderlin, ND, formerly of Fingal, ND passed away August 9, 2018 at Maryhill Manor in Enderlin. A funeral mass will be held on Saturday, August 18, 2018 in Holy Trinity Catholic Church, Fingal beginning at 10:00 AM. Visitation will be on Friday beginning at 6:00 PM with a prayer service at 7:00 at the church. Burial will be in the Holy Trinity Cemetery. Alice Agnes Sherman was born May 21, 1919 near Fingal, ND to Henry and Agnes (Schlegel) Sherman. She grew up on the farm and attended rural school near Fingal. October 7, 1941, she married John C. Puhr. They farmed together in Springvale Township for a number of years before purchasing his family farm. After John’s death in 1999, Alice continued living in their home before moving to Enderlin, ND. She loved having company, especially her grandchildren and great grandchildren. Alice enjoyed baking, gardening and spent many hours mowing the lawn. She was a member of Holy Trinity Catholic Church and Christian Mothers. Alice is survived by her sons, Steve (Melody) of Fingal and Paul of Embden, ND; daughters, Mary Ann Ritter of Hatley, WI, Cecelia (Jay) Wadeson of Fingal and Betty Storbakken of Enderlin; a daughter-in-law, Lynne Puhr of Lisbon, ND; 19 grandchildren and 40 great grandchildren. She is also survived by a brother, Loren (Connie) Sherman of Lisbon, ND; sisters, Alma Von Rueden of Grand Forks and Theresa Grasswick of Deer Creek, MN; a sister-in-law, Lucille Sherman of Fargo, ND as well as several nieces and nephews. She was preceded in death by her parents; husband, John; a daughter Genevieve; sons, Jack and Norbert; a brother and two sisters. 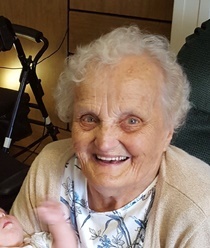 Alice’s family would like to thank the staff at Maryhill Manor for their excellent care and CHI Hospice for the extra care given to them as well as Alice.